BestMARC makes it easy for organizations to ensure they are maximizing the use of their subscription. Click on the Account link in the main menu to get to BestMARC's Account management page. The License tab displays details about your BestMARC license such as your subscription type, number of users, and expiration date. The Contacts tab shows contact information such as names, phone numbers, and email addresses for people in your organization. The Users tab displays BestMARC usernames for each contact that has a BestMARC account, and provides the Account Manager the ability to make changes. The Stats tab shows charts with the usage statistics for your organization. You can also view statistics for the individual schools, libraries, or users in your organization. The Activity Log displays a detailed breakdown of all the usage in your account, including links to reports from services you've purchased. Organization - The organization associated with your subscription. Depending on your subscription, this could be your library, district, or consortium's name. Subscription - The type of subscription purchased. Subscription type determines the features that are enabled in BestMARC. Account manager - The name and contact information for your organization's BestMARC Account Manager. Expiration - The day after which you no longer have access to the BestMARC platform. Sites - The sites at your organization that are licensed to use BestMARC. Contacts and Users are assigned to the site they work at. Some BestMARC features use sites such as seeing statistics for all users at a site, viewing all Downloads for a site, or sharing Global Edits or Workflows among members of a site. Right-click on a site and choose View Stats for this site to open the Stats tab, showing statistics for just that site. Users - Displays the number of users currently assigned to the subscription and the number of users that the Account Manager can assign to other employees of the organization. See Users for more details. Storage - The total number of records currently being stored by all users of your organization, along with the maximum allowed. The maximum is determined based on the subscription type and number of licenses. Add-ons - If your organization subscribes to any add-on services, they will be displayed here. Exports - The number of remaining record exports allowed for your organization. This applies only to certain subscription types. The Contacts tab shows contact information such as names, phone numbers, and email addresses for people in your organization. You can have as many contacts as you wish. Contacts are not limited by your license. New - Only the Account Manager may add new contacts (see below), otherwise this is disabled. Edit or View - Only the Account Manager may edit contacts (see below), otherwise this changes to View. Double-click on a contact as a shortcut to perform this action. Delete - Deletes the selected contact. Only the Account Manager may delete contacts, otherwise this is disabled. Refresh - Reloads the contact data from the server. Export to Excel - Export and downloads the contact data into a file that can be opened in Microsoft Excel. Print - Print the contact data to your printer. 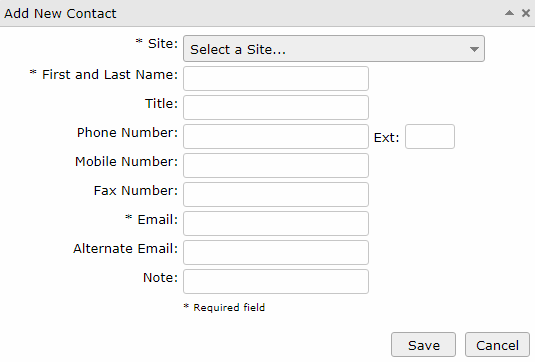 Account Managers may change a contact's information by opening the Edit Contact dialog. Other users in your license may view this information and must contact their Account Manager or Mitinet to make changes (the Save button will not appear). Site - Select the physical site that the person most often works at. This may be a school, a district, or consortium level. If this list is incorrect, contact Mitinet to make changes. First and Last Name - Enter the person's first and last name, separated by a space. Title - The contact's job title. For example, "Media Specialist", "Librarian", "District Coordinator", etc. Phone Number - Enter the contact's phone number as 000-000-0000. If there is an extension, enter it in Ext using numbers only. Mobile Number - If the contact has a mobile number, enter it here as 000-000-0000. Fax Number - If the contact has a fax number, enter it here as 000-000-0000. Email - This is the primary email address for the contact. When linked to a user, this is the address that they will receive their username and password. Alternate Email - An alternate email address for the contact. No emails are automatically sent to this address. Note - Any additional information you wish to store along with this contact. Users are contacts who have access to use BestMARC. Your license allows for a maximum number of users, which you can see on the License tab. Every user is linked with a Contact which contains information such as their name, phone number, and email address. New - Only the Account Manager may add new users (see below), otherwise this is disabled. Edit or View - Only the Account Manager may edit users (see below), otherwise this changes to View. Double-click on a user as a shortcut to perform this action. Delete - Deletes the selected user. The login, profile, and all data (records and downloads) will be permanently removed. Only the Account Manager may delete users, otherwise this is disabled. View Stats - Opens the Stats tab, filtering to just this user's statistics. Refresh - Reloads the user data from the server. Export to Excel - Export and downloads the user data into a file that can be opened in Microsoft Excel. Print - Print the user data to your printer. Account Managers may change a user's information by opening the Edit User dialog. Other users in your license may view this information and must contact their Account Manager or Mitinet to make changes (the Save button will not appear). Username - Enter a username that this person will enter to log in to BestMARC. If this username is already taken, a message will display and you must enter a different username. 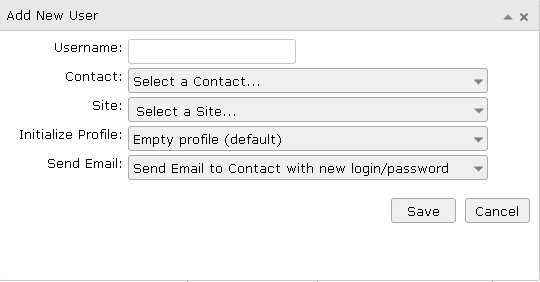 Contact - Select the Contact that is associated with this username. If they are not in the list, close this dialog and add one on the Contacts tab. Site - Select the physical site that the person most often works at. This is pre-filled with the Site that is associated with the selected Contact. If you change the Site here, the Contact's Site is also changed. Send Email - By default, an email is sent to the email address of the selected Contact with a welcome message along with their username and password. Use this option to re-send that email if requested. If the user already knows their username and password or you want to send it later, choose None to save without sending an email to the Contact. The Stats tab shows charts with usage statistics for your organization. 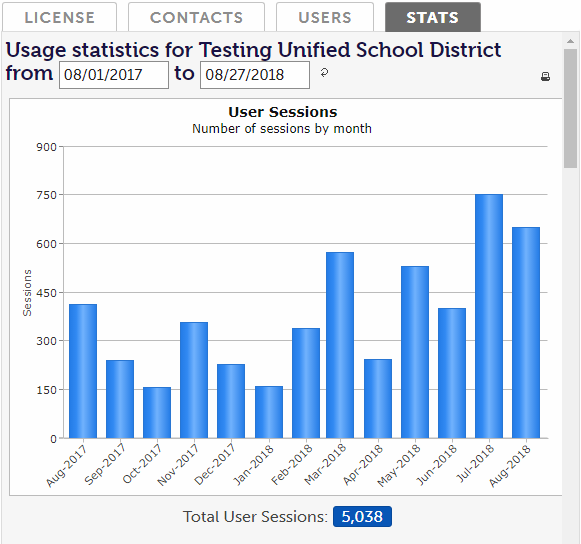 You can also view statistics for the individual schools, libraries, or users in your organization by selecting the Stats commands on other tabs. By default statistics are shown for the past year however you can change the dates to your chosen start and end dates and click the Refresh button to refresh the statistics. Note that statistics tracking began on January 1, 2016. Click the Print button to print out the statistics report. Click any statistics number in the report to view the Activity Log, filtered to that category. User Sessions - A session is counted each time a user begins using BestMARC after a period of inactivity. For instance, each time a user logs in is counted as a session. Searches - The number of times a user searches BestMARC. Search More Servers (z39.50) searches are counted separately but included in the search total. Records Added - The total number of records added into BestMARC, separated as having been found From Search Result or Cataloged from scratch. Records Edited - The total number of times the Save button was pressed in the cataloger, after the record has been added. Subject Explorer - The total number of subjects that were added to MARC records from the cataloger's Subject Explorer. Records Imported indicates the number of records Imported into BestMARC. Records Exported indicates the number of records Exported from BestMARC to the Downloads tab. These records are ready to load into an organization's Library Automation System. Global Edits - Number of times a Global Edit Run or Global Edit Preview was used in BestMARC. Records Global Edited - Total number of records that were run through Global Edits, broken down into records that had changes and ones without changes. An individual record is counted each time a Global Edit is run on it. The Activity Log tab displays a detailed breakdown of all the usage in your account, including links to reports from services you've purchased. Clicking on a statistics button in the Statistics report will show the detailed log activites filtered here. These events correspond to the summaries in the statistics report, except the log displays each individual event along with its details, the user associated with the event, and the date and time the event occurred. For some entries (such as Full Circle Service), a link to view the Report will also appear. You can manually filter events and usernames in the list by clicking a column's menu icon, selecting options, then clicking Filter. Change the dates on the Stats tab to filter the dates in the Activity Log.